If you travel at commute times or sail away for the weekend, you’d think almost all of it. It’s not uncommon to wait an hour or more to drive aboard during those times. The answer is 61 percent, which is still pretty impressive considering the boats run practically all day long. Individual routes ranged from 45 percent full for Seattle-Bremerton to 66 percent for Mukilteo-Clinton. Bremerton is largely a foot route. Seventy-four percent of riders are car passengers or walk-ons. Riders always complain that they need bigger boats, like on the Bainbridge route, but they really don’t. It’d just be a waste of fuel and labor costs. Bremerton, however, is bumping up to a new 144-car Chimacum in 2017, whether it needs to or not. It can grow into it. Bainbridge has similar characteristics to Bremerton because it’s going the same place — to a major city. Sixty-nine percent of its customers are passengers as opposed to drivers. Only 43 percent of Fauntleroy-Vashon-Southworth riders are passengers, 48 percent on the Edmonds-Kingston route and 56 percent for the system overall. Almost never does a ferry reach passenger capacity, though it might seem so in early morning when the booths become beds. The day of the Seahawks’ parade after winning the Super Bowl was a notable exception. Though an average of 61 percent of the system’s car decks are filled at any time, just 12 percent of passenger space is being used. It ranges from 7 percent at Point Defiance-Tahlequah to 18 percent for Anacortes-Sidney, British Columbia. It’s hard to put fannies in up to 2,500 seats. Do you recognize any of the bridges up above? We could have a contest, except then I would have to know what they all are, which I don’t. 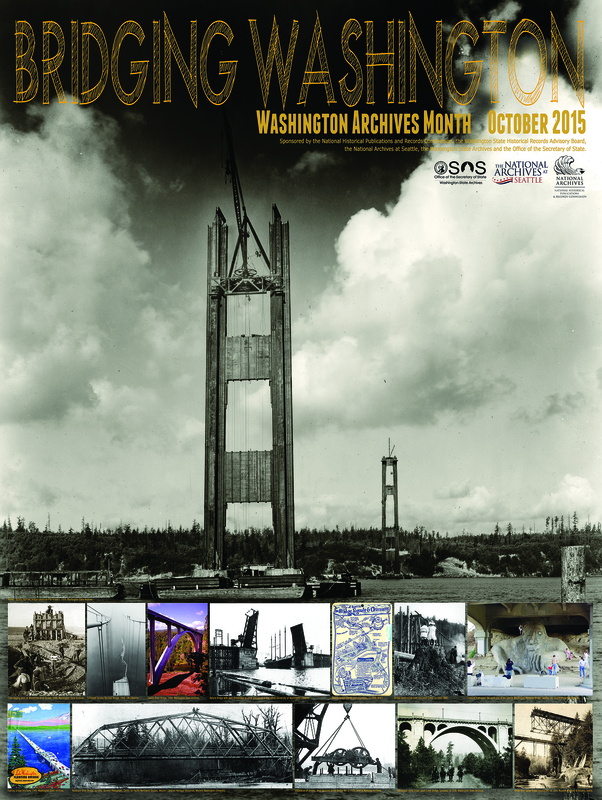 Anyway you can pick up this poster of historic Washington bridges for free through October at the State Archives headquarters in Olympia or at the Secretary of State’s main office at the Capitol in Olympia. They’ll be having an open house down there from 10 a.m. to 2 p.m.See if you can name them all. I’ll find the answers. How bad has traffic become when drivers take backroads to get around the freeway? I feel so lucky every morning when I see the traffic report and know I don’t have to go on the other side of Puget Sound. My wife does. I can plan my trips around Kitsap Peninsula down to the minute. She has no idea when she’ll get to work, or back home. I always felt those estimates of how much productivity we’re losing because we’re stuck in traffic were bogus. I equate productivity with work, and just because it takes you two hours to commute doesn’t mean you can cut two hours off your shift. It’s subtracted from time with the kids, at the gym, sleeping. Here, we might have an hour of heavy traffic twice a day at a few spots. There, my wife gets off the highway as soon as she crosses the Narrows Bridge and winds her way all the way to King County without getting back on. And it’s faster. It just defeats the whole purpose, defies the definition of a freeway. How can people commute like that? I guess they don’t have much choice, if they want to get paid. You’d think at some point companies will have so much trouble moving workers and products that they start relocating to the peninsula. I wonder if ferry fares and bridge tolls are holding them back. Legislators a few months ago passed a $16 billion, 16-year transportation package. Something had to be done. But I have a hard time imagining traffic will be any better in 16 years. Hopefully we can keep keep pace, and I won’t get transferred to the other side. Can you picture what the roads here will be like in 16 years? Probably still crowded in the usual places. Out of that $16 million, we’ll be getting money to improve Highway 305 between Poulsbo and Winslow, though it’s not sure how. They’ll also be re-striping the Highway 3-Highway 304 interchange near the Bremerton treatment plant. That’ll get better flow coming south on Highway 3 at the expense of backing Highway 304 farther into town. Guess I better start looking for some backroads.